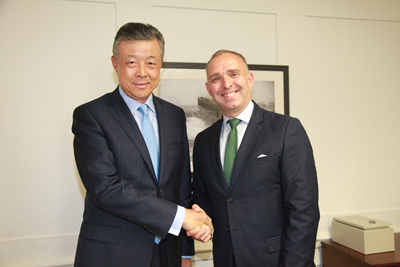 On July 5, Ambassador Liu Xiaoming met with UK National Security Adviser Mark Sedwill at the Cabinet Office. The two sides exchanged views on China-UK high-level exchanges, security cooperation, and international and regional issues of common concern. Ambassador Liu congratulated Sedwill on his appointment as National Security Adviser. He said that China-UK relations are currently maintaining a good momentum of development, and security cooperation has become a new highlight in the bilateral relations. China is willing to work together with Britain to maintain high-level exchanges, deepen law enforcement and security cooperation, strengthen coordination and communication within the United Nations, G20 and other multilateral frameworks and over major international and regional issues, continue to consolidate the "Golden Era" of China-UK relations to benefit both peoples, and contribute to world peace and prosperity. Sedwill said that Britain is committed to building the "Golden Era" of UK-China relations. The international situation is complicated and volatile, and the international community is facing a number of major challenges. Britain and China share broad consensus and common interests on free trade, climate change, combating transnational crimes and anti-terrorism. Britain is ready to strengthen communication with China and join hands with China to promote the international community to meet the challenges.